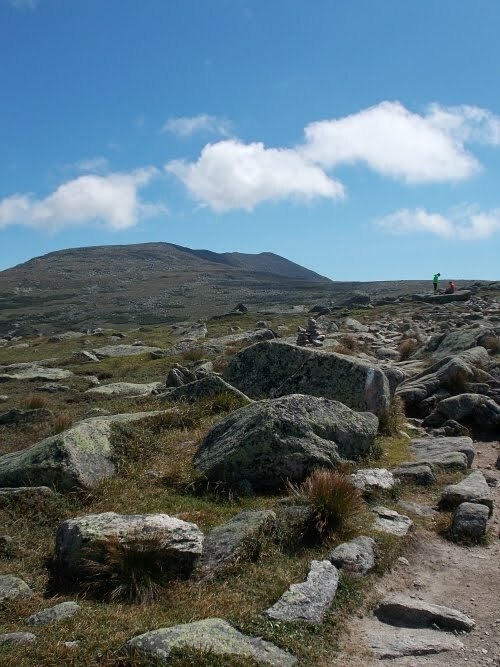 Another Long Walk: Day 160: Summit Day! August 14: It was summit day! My last day on the Appalachian Trail. After 160 days, I was finally at the end of the trail. Bittersweet, but glad it would soon be done. 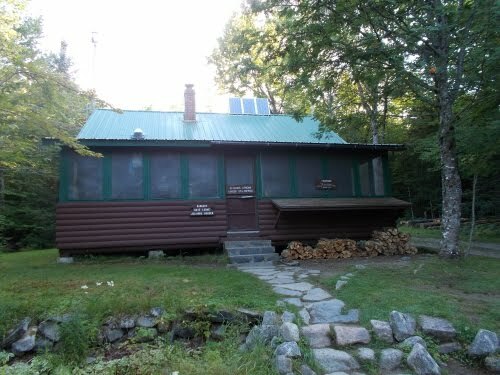 The ranger station where I checked in as thru-hiker #252 to finish the trail. 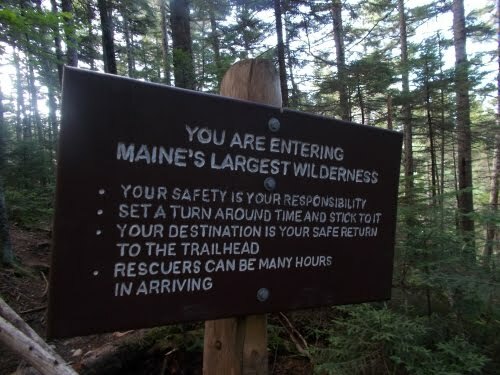 No, I was going to summit Katahdin again. It wouldn't be right not to! Anyhow, I still needed the photos for Walking 4 Fun. I didn't take enough during my 2003 thru-hike which was the whole reason I was out here a second time in the first place. I took my time packing up camp, giving the morning time to burn off some light morning fog. I was in rush--I had a mere ten miles to complete. Granted, it's a tough ten miles, but even at a measly 2 mph--I'd be done in five hours. Maybe six hours if I take an extended break to savor the moment at the top. So it wasn't until 7:00 that I was finally packed and ready to go. From the shelter, I walked the 0.2 miles to Katahdin Stream Campground. I carried two packs--one on my back, and one in my hand. 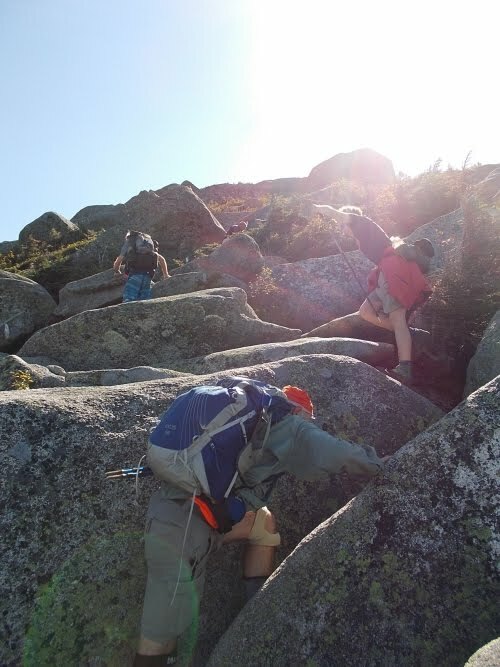 The second pack was borrowed from the nice rangers who provided them for thru-hikers to slackpack up Katahdin. I picked it up the evening before when I checked in at the ranger station. No reason to carry gear I wouldn't need when I'd just be walking back down to here! So I was carrying the borrowed pack in my left hand back to the ranger station where I'd store it until I returned. My trekking pole was in my right hand, but I wasn't using it since the ground was a dirt road that was completely and utterly smooth. And somehow, my trekking pole got twisted up my legs and tripped me. I crashed to the ground on Tote Road in a most spectacular fashion, totally face-planting into the road. Both of my hands were full so I couldn't catch myself. My immediate sensation was pure shock. What the hell happened?! I picked myself and looked around, but nobody appeared to notice my fall. Nobody was around to notice my fall. My right knee throbbed with pain--I had banged it pretty hard. I took a few steps and the knee throbbed even more. 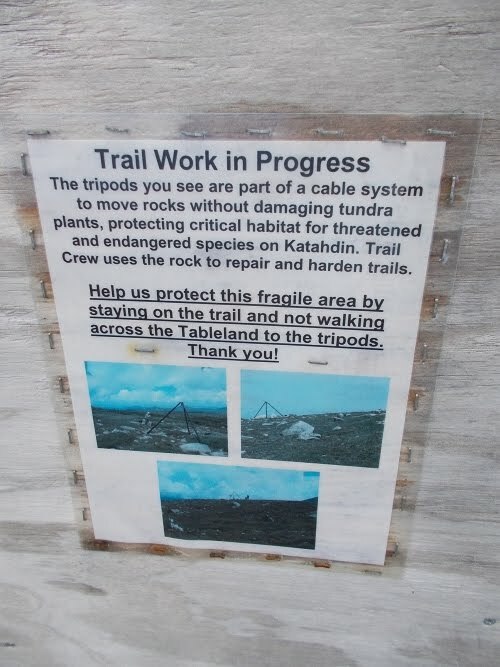 So much so that I worried if I'd be able to summit Katahdin after all. I knew what the trail ahead was like. 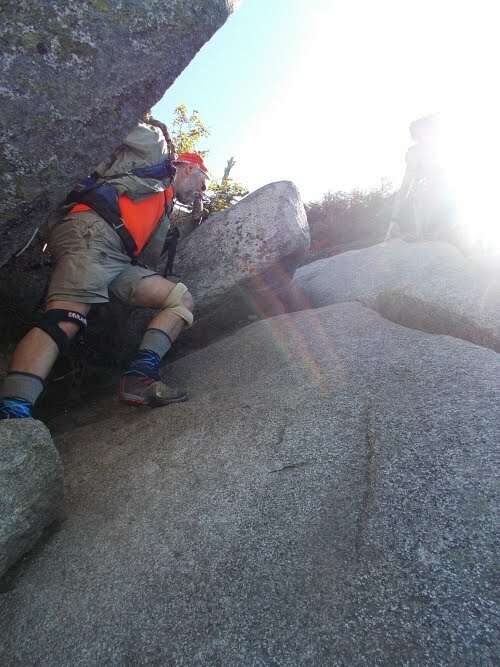 A jungle-gym of boulders that required a great deal of scrambling, and it was a less than ideal place for an injured knee. The first mile or so, the trail climbed gradually and I soon caught up with Salty Dog and met his wife who had come out to join him for this last section. I also caught up with Red Titan and her dad. Her dad I'd seen numerous times waiting for her at trailheads since Vermont, but it was actually the first time I met Red Titan who I'd heard so much about. The injured knee definitely slowed me down some, but I was still in considerably better shape than most of the day hikers going up and I passed people quite regularly. 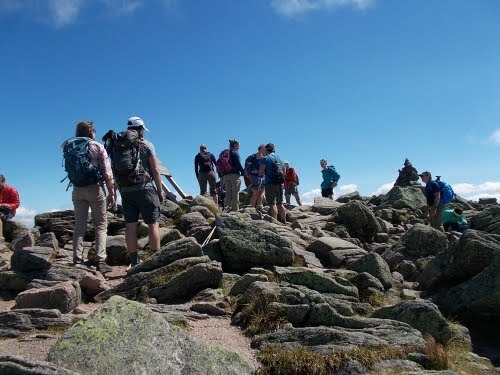 Katahdin is a very popular destination and I started counting the number of people I passed. I lost count after about 30, though. It was a busy, busy trail! And it was an absolutely beautiful day for it! Mostly clear with a few high-flying clouds to give the sky some character. 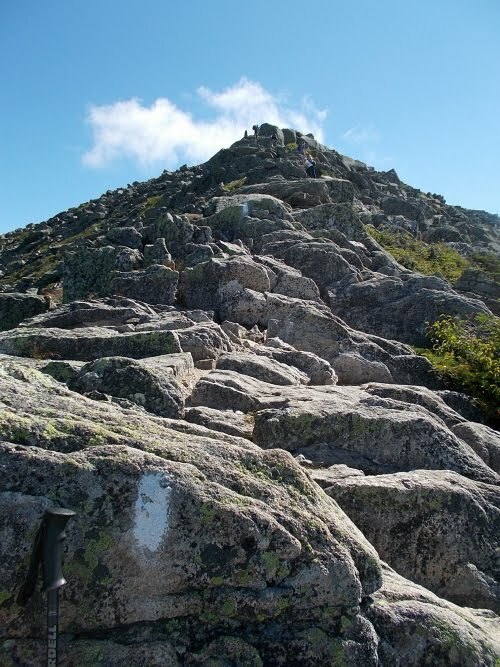 The summit of Katahdin--for the time being--was actually clear of clouds. The stars had aligned well! 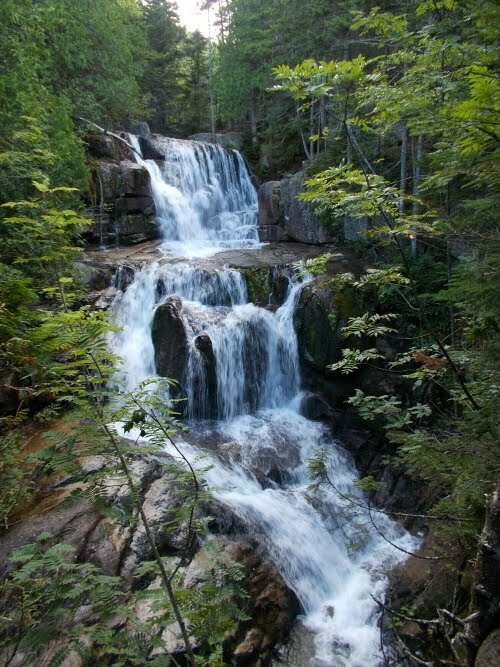 Katahdin Stream Falls is perhaps my favorite waterfall of the entire trail! A little over a mile later, I reached the beautiful Katahdin Stream Falls, and admired it for a few minutes. I didn't linger too long--I could linger on my way back down. I had Summit Fever and just wanted to get to the top at this point. 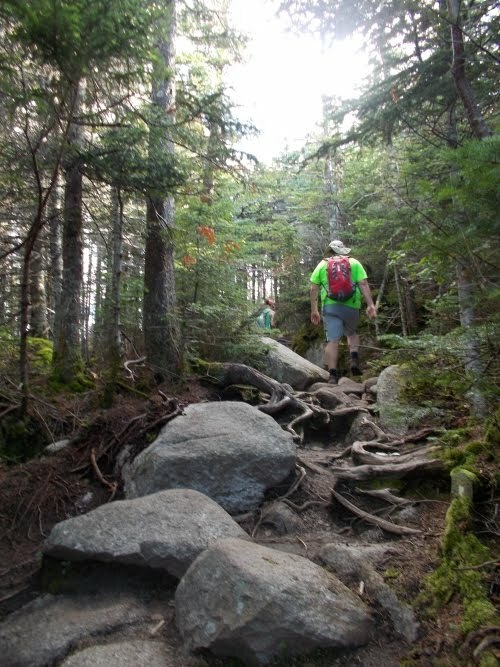 Now the trail became even stepper, but it wasn't until the trail popped above tree line that the trail becomes spectacularly difficult and a giant maze of boulders that needed to be navigated. Progressed slowed to a crawl. The throbbing in my right knee increased dramatically as well, but I pushed onward and upwards. Maybe three hours into the hike, I started passing people I knew already heading back down the mountain. 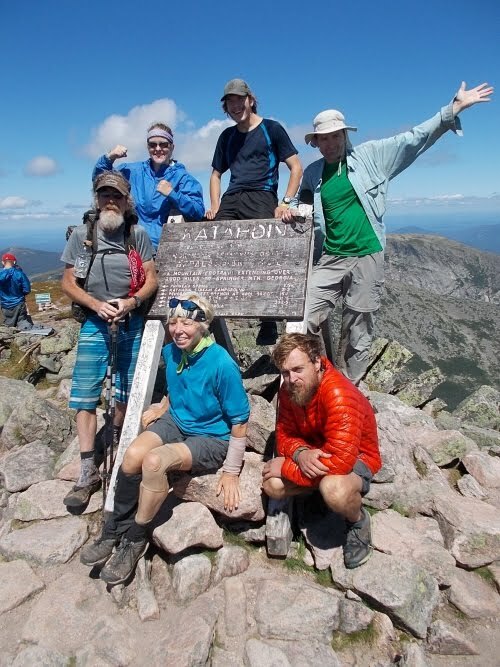 Axon and Shrugged--the French Canadians I kept seeing in the 100-Mile Wilderness--had already reached the summit and were coming back down. Near the top I passed Loon who was also heading down. These people must have gotten some seriously early starts in the morning! And at around noon, I approached the summit. It was swirling with what seemed like a hundred people. I took photos--lots of photos--and admired the commanding and dramatic views. 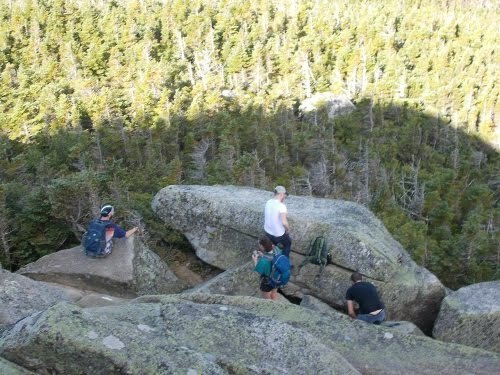 Absolutely, jaw-dropping beautiful views and among the very best of the entire Appalachian Trail. I had missed these views my first time up in 2003 due to fog, but I made up for it this time around. I didn't want to leave. It was so amazing up there! Other thru-hikers arrived soon behind me. Some of them I knew, some of them I didn't. I was surprised when Young Blood walked up shortly after me, hollering with joy upon his arrival at the summit. Nothing subdued about his summit, but I was surprised to see him at all. 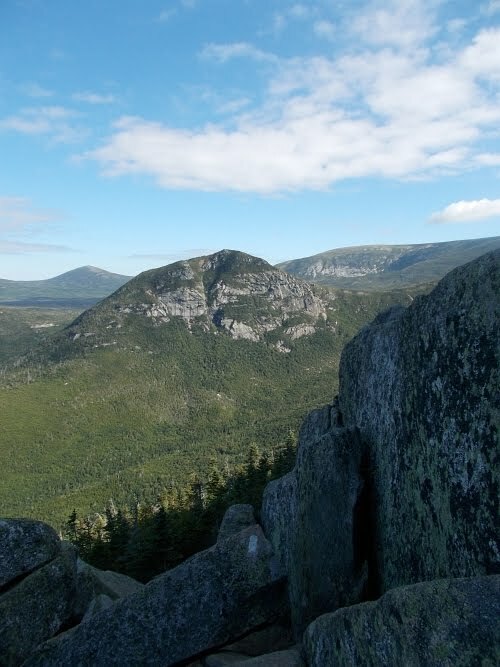 Last I knew, he had camped near Abol Bridge last night, and he told me that he started hiking at 2:00 that morning or some ungodly hour to summit today while the weather was good. Tomorrow, he said, the weather was expected to be a lot worse so he pushed himself hard to reach the summit today. Salty Dog had the same concerns about the weather tomorrow and actually skipped the trail between Abol Bridge and Katahdin Stream Campground completely. His plan was to summit today with the good weather, then go back and finish that section he missed tomorrow when rain was expected. So technically, Salty Dog had yet to finish the trail. He'd finish tomorrow--but I think he made the right decision. Today was the day to summit, no argument there! Eventually I moved off to the side where I pulled out my cell phone and checked to see if I got a signal. I wanted to tell both my mom and Amanda that it was official--I had finished the trail. I still needed to hike back down to the trailhead, but I was done. It was time to leave this trail. I talked to my mom, but Amanda was presumably flying because my call went to her voicemail. I left her a message. I also tried using the weak Internet connection I had to post a photo of the summit to my Facebook account, but it was too much for the feeble connection. I'd have to post photos later. After about an hour of lingering at the top, I started heading back down and was surprised to see Good Man nearing the summit. 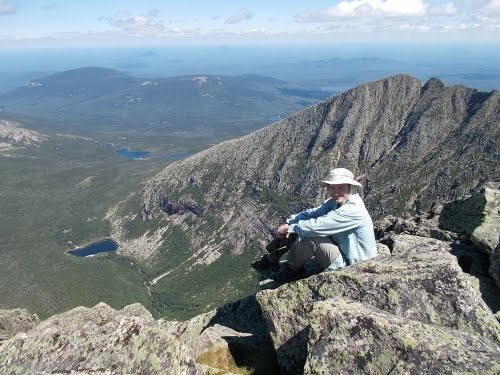 He too had started hiking at an ungodly hour to make it from Abol Bridge to summit today. So we high-fived each other and chatted for a few minutes. He pointed down the trail to a specific person on the trail. Just a dot from our location, but he described him as a bit chunky, wearing a certain color shirt and hiking by himself. But he said he knew that person. They crossed paths completely by accident, but they had gone to school together years ago, and this guy was just starting the trail, planning to hike southbound to Springer Mountain. This was his first day on the trail. "Poor guy," I said sympathetically. Good Man seemed to think that was funny, but he was getting to a point. "This morning," Good Man continued, "he put sunscreen on his face. Or rather, he tried to. But he accidentally used toothpaste instead." "So he rubbed toothpaste all over his face thinking it was sunscreen. When he realized what he did, he tried to wipe it off, but there's still bits of it you can see in his beard and on his face. His trailname is now Sensodyne." We gave each other a fist bump and continued on our separate ways. Above tree line, the trail became a lot more difficult and slow! Maybe ten minutes later, I reached Sensodyne. When we approached each other, he stopped briefly on the side of the trail to let me pass. Actually, I think it was a convenient excuse just to stop and rest. He looked sweaty and exhausted, hurting from the steep climb up. "You're almost there!" I said to him. "Just a little bit further!" And I could clearly see some bits of white toothpaste in his beard. It was very difficult for me to keep a straight face. It could have easily passed as sunscreen that he didn't rub in very well, but I knew better. "Hey," I said, "you missed some of the spots of sunscreen on your face," I commented innocently. He smiled, in an embarrassed sort of way. "Oh, that.... that's toothpaste," he told me, launching into an in depth explanation of how he had mixed up his toothpaste and sunscreen earlier. I laughed, no longer having to keep the straight face. And he said he was just starting his south-bound thru-hike. Today was his first day on the trail. Taking that as my cue, I launched into my spiel: "Don't do it! Quit! Quit while you still can! It's not worth it!" I said with conviction. Synsodyne looked surprised, and I toned down my rhetoric. "Here's the thing," I confided. 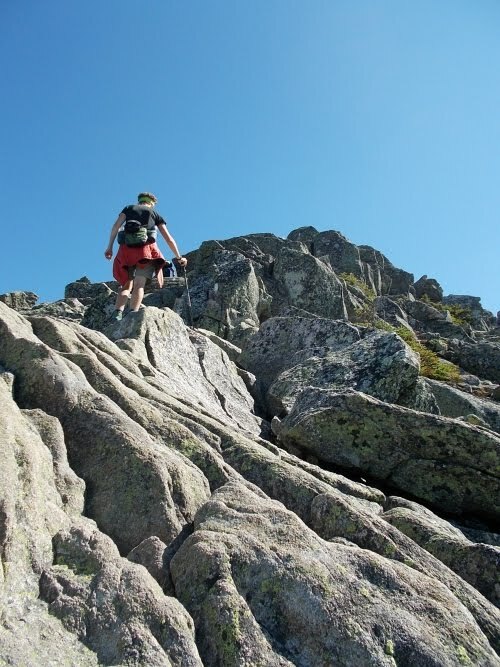 "Katahdin--this is the most difficult most beautiful part of the entire trail. It's all downhill from here. Literally and figurative. Save yourself. 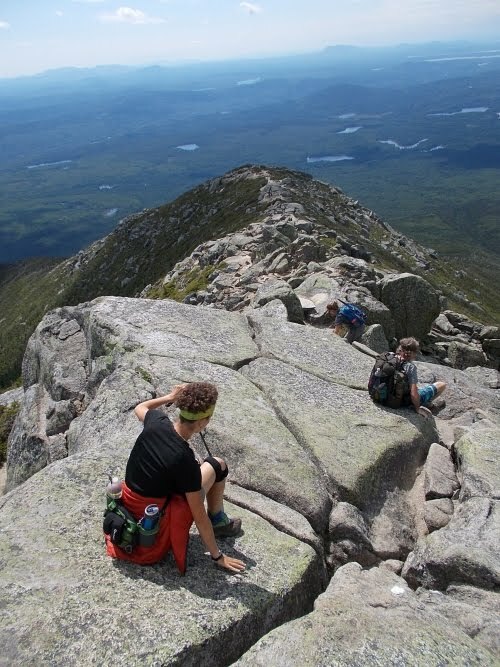 Once you've done Katahdin, you have nothing to prove. This IS the hardest part of the entire trail! And it's the most spectacular! You've already done it all! You can quit now and save yourself all that heartbreak you'd otherwise have!" The man looked like he might be taking my advice seriously, contemplating my words. Then I popped the bubble. "Oh, screw it! It's an adventure! What else are you going to do for the next five or six months? Go for it! Do the whole trail! Have a blast!" My sudden turn-around seemed to surprise him as well, so I confided even more. "Good Man told me to say that," I whispered. Then you could see the wheels in his head clicking. Ah.... he knows Good Man. "Wait a minute.... so you already knew about the toothpaste fiasco?" We talked for a few more minutes then continued on our separate ways. On the way down, I walked first with Red Titan and her dad, then later with Salty Dog and his wife. They were all relatively slow hikers. Well, Red Titan wasn't particularly slow, but her dad was so she'd stop to wait for him regularly. I wanted to walk with some slow people, though, because by now my knee was absolutely killing me. This rock scrambling was causing a lot of trouble with it, and I wanted some slow hikers to check my speed. I didn't tell them that, but I was limping pretty badly at this point. 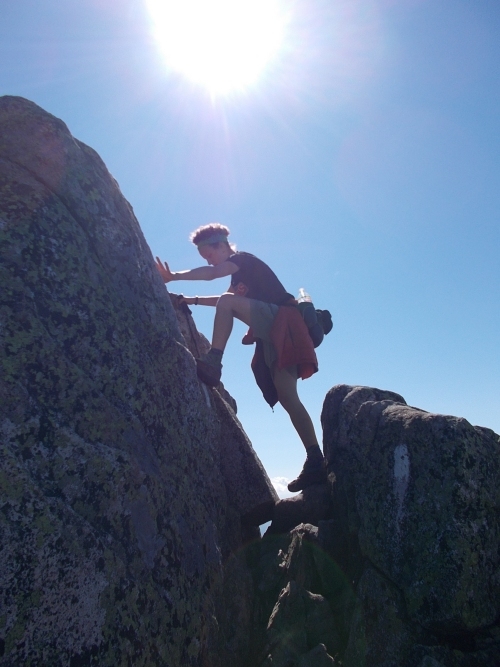 At one point along the strenuous descent, I lost my grip on my trekking pole and dropped it--right into a narrow crack of two large boulders. @#$#!!! I took off my pack and tried squeezing myself down the crack to retrieve the trekking pole. I could see it, but I couldn't quit reach it. It did, however, appear that light was entering the cavern from the side, so I scrambled down the side of the boulder to another (larger) entrance and was able to squeeze in far enough to retrieve my trekking pole. I needed to be more careful with that.... you could lose gear permanently in some of these cracks. I was fortunate to loose my trekking pole down a crack where I could retrieve it from another direction. And in the mid-afternoon, I finally reached the Katahdin Stream Campground. I headed back to the ranger station to retrieve the rest of my gear from the smelly pack I left behind, then tried hitchhiking back to civilization. Well, hitchhiking isn't an entirely accurate term. 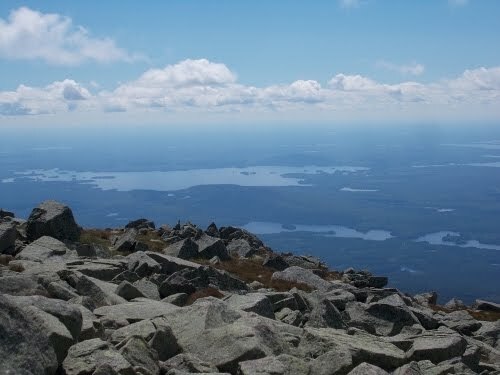 I'd approach people who were just finishing Katahdin asking if they were heading out of the park and back through Millinocket. 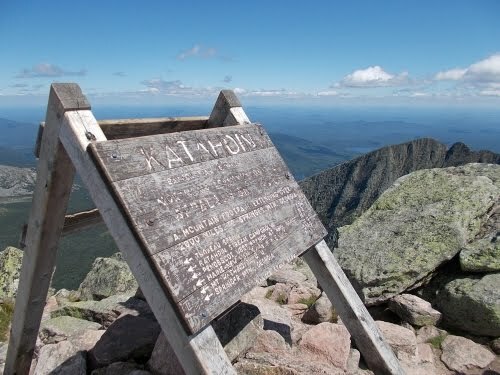 Katahdin is a destination. People to there, then they go back home. I didn't have to stand on the side of the road hoping a passing stranger would stop for me. I just had to ask people as they were getting into their car for a ride. But I struck out. One woman was picking up a bunch of hikers from the trail and wouldn't have room in the car. Others were camping nearby and not heading back into Millinocket. 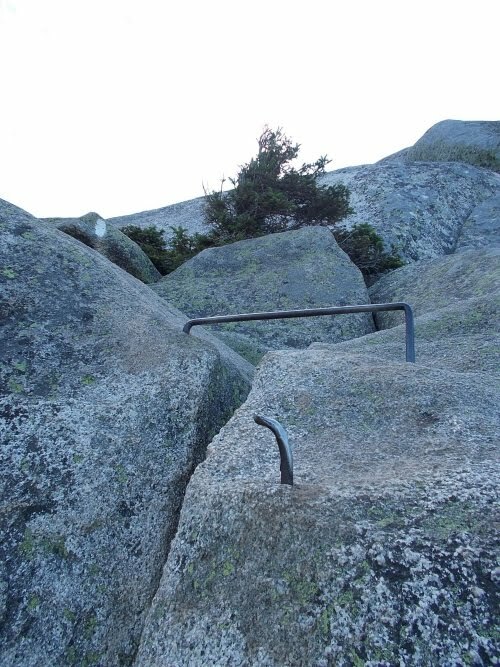 But sometimes, you had these metal bars stuck into the boulders to help with the scrambling. Not enough of them, but I'll take what I can get! Eventually, Salty Dog and friends took pity on me and gave me a ride out of the park. They dropped me off at a campground that they were staying about a mile short of Millinocket, not wanting to take the one-mile detour into town to drop me off. A mile walk into town normally wouldn't have bothered me too much, but I was exhausted and my knee was still throbbing painfully. I was a little annoyed that they wouldn't drive me the extra mile into town--it wasn't that far away. If our rolls were reversed, I'd have driven the extra mile in a heartbeat. But I had another idea for how to avoid walking the last mile into town or trying to hitch a ride from a passing car: I pulled out my smartphone, called the hostel I'd be staying at and asked if they could send a shuttle to pick me up. My guidebook did say that they regularly shuttle people to the trailhead for Katahdin--my requirements were considerably shorter than that! I just needed a ride for the last mile! The woman I talked to on the phone said that wasn't a problem, asked me exactly where I was located. I told her the name of the campground and that I was the only person standing outside by its entrance so I'd be hard to miss. A few minutes later, a van pulled up and I hobbled into the front seat. 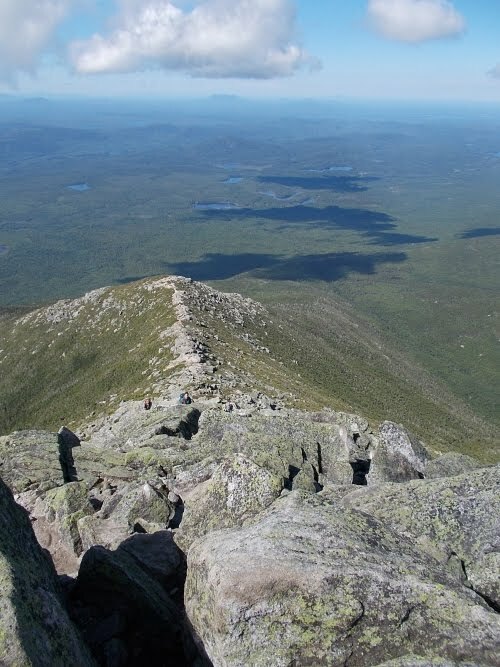 "Looks like Katahdin really beat you up," she said, noticing my heavy limp. I grinned. "Actually, I got this injury on Tote Road before I even got on the trail." And I told her the story of my fall. She seemed to think it was hilarious. 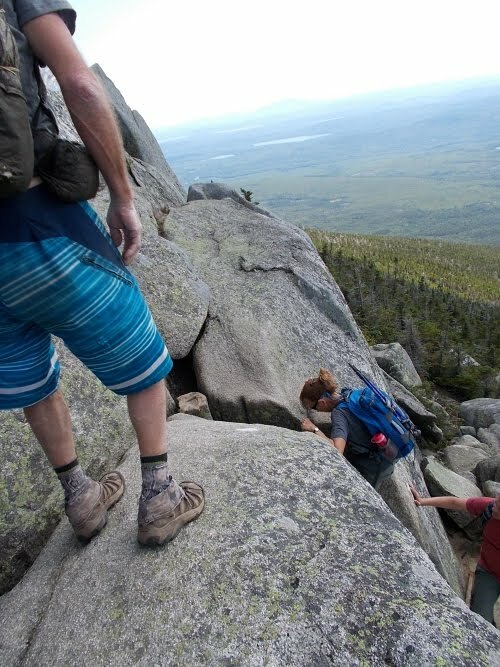 Lots of people have gotten injured climbing Katahdin over the years and needed rescuing, but apparently I was the first person she'd ever heard of injuring themselves on Tote Road before even starting the climb. "I made it, though!" I said with pride. "But my knee is going to pay for it for awhile. I'm just glad I don't have to hike anymore. Not for awhile, at least." 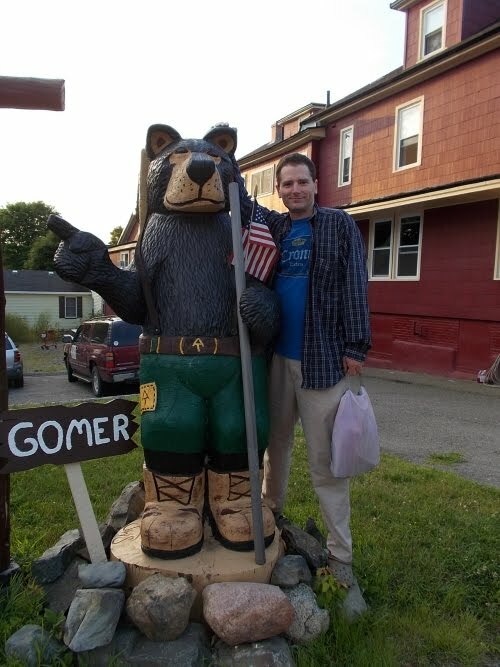 I soon checked into the hostel in Millinocket. For dinner, I headed to the Appalachian Trail Cafe with a group of other hikers to celebrate our completion of the trail. Well, for some of us, it was our completion. We were a mix of hikers. Some were flip-flopping and had started at Harpers Ferry so were now only half done with the trail. 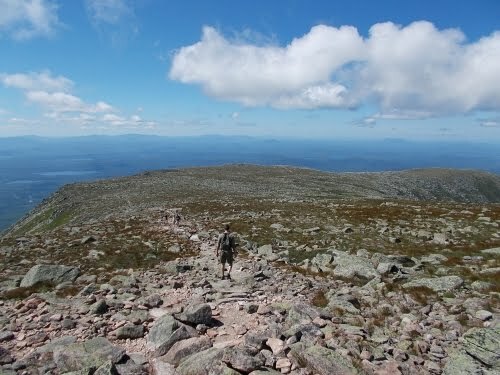 One of others had just started the trail, climbing Katahdin, but hurt so bad afterwards he got off the trail to recuperate before returning to the trail later. 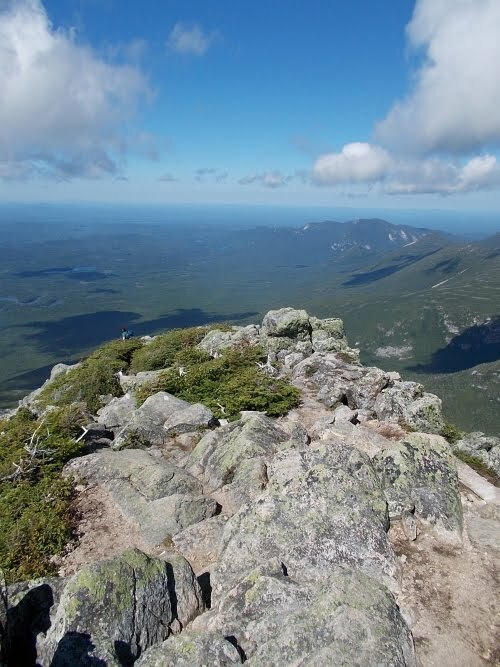 But all of us had summited Katahdin that afternoon and regardless of whether it was our first day on the trail or our last, we all felt like we had something great to celebrate. Red Titan's dad, whose name I now forget. Everyone just tended to call him Red Titan's dad! From front to back: Red Titan's dad, Red Titan, and Salty Dog. The end is near! 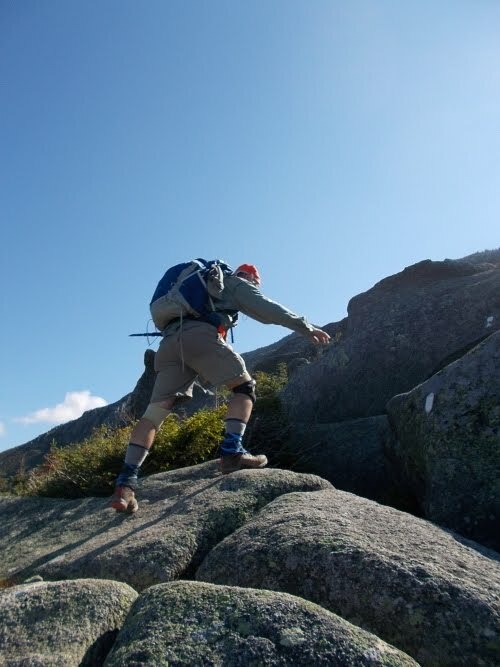 The AT follows that ridge of boulders right to the top. Red Titan scrambles up the trail. This really is the trail. See the white blazes? On the boulder to the right, and the other by her raised foot? They call this a TRAIL?! What is that strange contraption alongside the trail? There you have it--it's part of a cable system to move rocks. There were a heck of a lot of people at the summit--but what a beautiful day for it! All of the thru-hikers at the top at this time did a group photo. That's Young Blood sitting on the sign, and the older fellow on the left is Salty Dog. The woman in front... I forget her name, but she was from Norway or something and spoke with a really thick accent. I had met her very briefly in Monson. The other two... I didn't meet them until here at the summit! I spent about an hour at the top savoring the views. Salty Dog and his wife navigate a particularly tricky spot down the mountain. 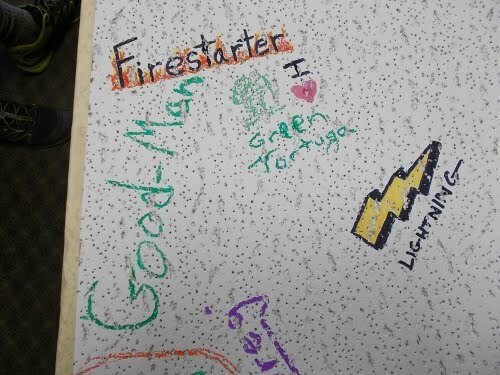 Good Man admires the ceiling tiles of the Appalachian Trail Cafe. frm dubrock an American hiker living in Fr. I can't believe all those rocks you had to climb! What a trail! I thought it was rough before but this last climb looked really tough - and with a bad knee too! The views were fabulous! Thanks for a great virtual hike! Congrats! So sorry to see the blog come to an end. I've really enjoyed reading it and seeing all of the pictures. Truly enjoyable. So, are there many letterboxes around/on the trail??? Did you carry a journal along with your stamp? Congratulations! It's been a fun vicarious journey. I know it's been over for you for a while now, but congrats for finishing! I was wondering; how much extra time do you think it took you this time - by taking the photos for your site - than it did the first time? Congratulation on finishing an amazing journey! Bittersweet is the exact word I thought of, as I sat with butterflies in my stomach, not sure if I wanted to click the link yet and read the end of the journey! I laughed when I read the first paragraph. At least I can go back and start reading from the beginning of the blog, since I've only read the AT entries. Thanks for the virtual tour! MoonshineOverKY: There are a lot of letterboxes along the trail, and I did carry a journal with my stamp to search for a few, but I didn't really organize myself well and searched for maybe a dozen boxes in total. Usually when Amanda ran some searches, printed clues and told me roughly where and what order I'd come across them on the trail.